Joey Sturgis Tones is currently offering its Finality Advanced limiter plugin at reduced price. Joey Sturgis Tones have released a demo version of their Finality limiter plugin. 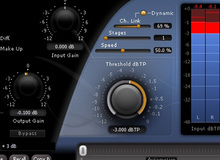 TBProAudio has updated its LA xLimit lookahead limiter to version II.